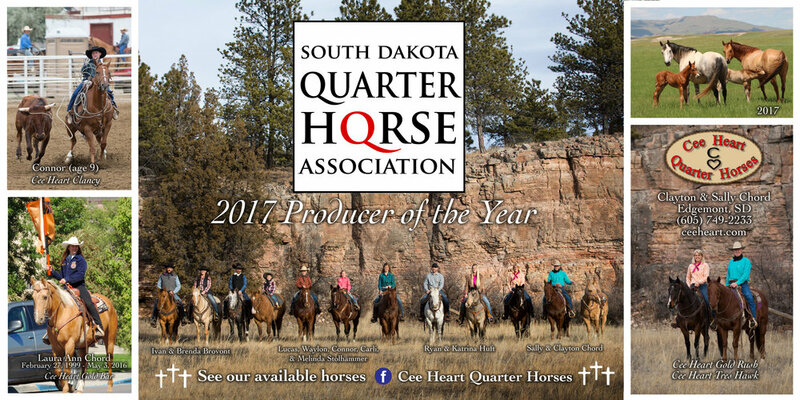 Cee Heart Quarter Horses awarded SDQHA 2017 Producer of the Year! Celebrating our 35th Foal Crop this year! Cee Heart Quarter Horses are raised on the Chord Ranch by Clayton & Sally Chord in the southern Black Hills of South Dakota. Many of our horses trace to horses Sally's parents had in the early 1960's. We have continued their program of raising family horses since 1983. These horses run in big pastures with rim rock canyons, steep hills, & fallen timber. We are in the Northern High Plains where the winters are cold & the summers are hot. These horses have adapted to this environment. Cee Heart Quarter Horses excel as all around horses because of their breeding & environment. They have gentle minds & excellent conformation. Many are family & youth horses.